As we enter the historically wettest winter month of the year, we have to look back at the biggest snow year in recent history with a sense of awe. Skeptically, I wondered 5 months ago whether we’d even get a winter at all. Meteorologists flopped back and forth — would we see another mediocre winter, or would we reap the benefits of a lower jet stream and La Nina weather patterns? After a later-than-usual start to the snowfall, the residents of Wyoming saw what would we now know as the third wettest (so far) winter in recorded history. Weekly storms originating in the Pacific Northwest brought moisture-rich snow by the foot, quickly piling high in the mountains. Yes, we had a good winter. 1) Good skiing. 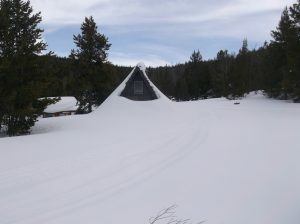 Local ski resort, White Pine, boasts 222″ with a 50″ base. Meanwhile, Jackson Hole has recorded 550″ as of yesterday. You can count on one hand the number of times that’s happened in the resort’s history. 2) Lots of water. When there’s a lot of snow in the mountains, that means lots of water down here in the valley once it melts. Translation: the fishing stays good longer. A large runoff season also cleanses the rivers of mud and trash — a natural, and crucial, cycle. 3) Less wildfires. An extended saturation means the likelihood of wildfires decreases dramatically. This is good for those looking for great views in the mountains and also means cleaner air quality for those recreating outside. However, there is one downside to large snow years… The mountains remain inaccessible for longer. Last week, I took six days off and headed into the Wind River Range to ski. A good indicator of the caliber of snow year we’re having is to look for familiar landmarks: the bathroom at Trail’s End campground, the sign at Miller Park, the snow depth at Sweeney Meadows. For reference, I probed 9 feet, 4 inches of snow at Sweeney Meadows. After perusing http://www.weather.gov/riw/drought_4 , our division had the third wettest winter since 1899, when the National Weather Service began recording precipitation totals for Wyoming. Elkhart Park’s Snotel data gathering center has the area at 167% of average snowfall and depth; Big Sandy Opening comes in at a startling 172% of normal for the year. So what does this all mean?! Not much. March can be one of the wettest months of the year, but so far we’re seeing spring-time temperatures in the 40s and 50s. Last February, we saw days in the 60s which spiked water levels and initiated an early runoff event. What is for certain, however, is that we’re seeing snow fall totals that rival record years. By keeping an eye on the weather patterns, we can predict when the mountains will be accessible. 1) Look for lower elevation trail-heads. Being at around 9,200 feet, Elkhart Park and Big Sandy are usually the last trail-heads to become accessible. However, look to the north, and you see that Green River Lakes trail-head sits squarely at 8000 feet. 2) Find southern and eastern-facing trails. Southern and eastern-facing aspects tend to stay in the sun all day. This means the snow on these trails evaporates and melts much faster than a trail with a north-facing aspect. You can find all the maps and guidebooks you need to get out in the mountains here under the Shop tab at the top of the page. If you’re looking for the most up-to-date fishing and trail reports, don’t hesitate to call us at (307) 367-2440, or email info@greatoutdoorshop.com.